All of you who have hard-boiled eggs in your fridge from Easter, this one’s for you! This is what I call a grown-up egg salad sandwich. I used to love egg salad as a kid, but as I got older something about the heavy mayo goop just turned me off. That is until I tried this version. It’s a bit lighter than your average egg salad and it has an unexpected ingredient; lemon zest. The lemon gives it a bright, fresh, flavor you don’t expect, but it compliments everything so well. So don’t leave it out! Plus, this has bacon on it. And what meal isn’t better with bacon?? It’s easy to whip up, so give it a shot. 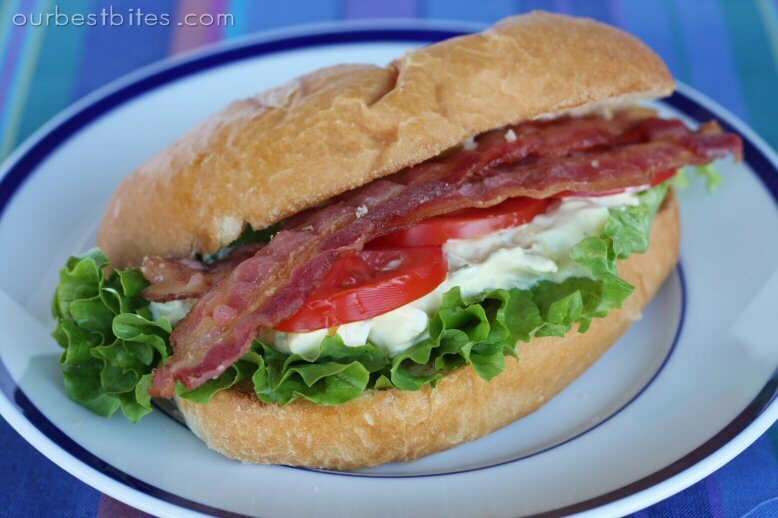 Rolls, sour cream, mayo, dijon mustard, pepper, hard-boiled eggs, lettuce, bacon, tomato, onion, lemon. *if you like it extra tangy, add a teaspoon of vinegar too. 1. Combine mayo, sour cream, green onions,Dijon, salt, pepper, and lemon in a medium bowl.Stir to combine well. 2. Coarsely chop eggs and add to mayo mixture. Stir gently to combine. 3. Arrange rolls or bread on work surface. Top each bread slice with about 1/2 cup egg mixture, 2 bacon slices, 2 tomato slices, a lettuce leaf, and top half of roll. Serve sandwich immediately. So, I’m such a slacker..this is the first time I’ve checked your blog. But it looks fantastic! That looks really yummy! I have a great egg salad recipe that I really love, but I’ll definitely have to try this one. Yum, I made this tonight! I tried it before and think I must’ve left something out on accident, because it was much better tonight!! eric, you lucky bumb…i hope i’m lucky enough to find a wife who makes spectacular dishes for her blog, and then lets me devour them once the pictures are taken! This was so good! I had to go the store that day and picked up the stuff to make it. Yum!!! Sara, I love this blog! I blog stalked you through Erika’s blog. I’ve been bad about cooking since having the baby but your blog is motivating me and giving me ideas. Hey Sara, we tried this today, and they turned out great! Thanks for the help and idea. This is going to be our Easter dinner this year for sure. What could be better … using up eggs and easy!!? If you happen to see this … wondering if there is a difference between scallions and green onions? I've seen a few recipes lately for scallions and your egg salad reminded me I was never able to find them in the grocery store. I've always just substituted green onions but started wondering if there may be a better way? Since you are my new cooking resource I figured you gals would know if there is something to it. Scallions and green onions are the same thing! So if you ever see either one in a recipe it's talking about the same thing. This looks incredible! I had never thought to add lemon zest or a little vinegar to egg salad. I can’t wait to make these sandwiches. These were sooo yummy! I also made them for dinner with left over Died Easter Eggs! We loved it and I shared it on my blog! Hope that’s ok.
p.s. I have asked for your cookbook for Mothers Day! I’m so excited! The lemon zest in the egg salad makes it the best egg salad I’ve had. Ever. It’s amazing how something so simple makes such a difference. This is easily my favorite egg salad recipe! I use my mushroom press to chop the eggs, slice them one way and turn just a bit and slice again. So fast and easy.